This class is all about basic good-manners. It is designed specifically for dogs 5 months old or older with little or no previous training and/or dogs who are newly adopted, regardless of their prior experience. We cover all the basics like sit, down, stay and come. Working in this class will help you and your dog build a solid foundation and improve your working relationship. Attention and focus are the goals of this class. 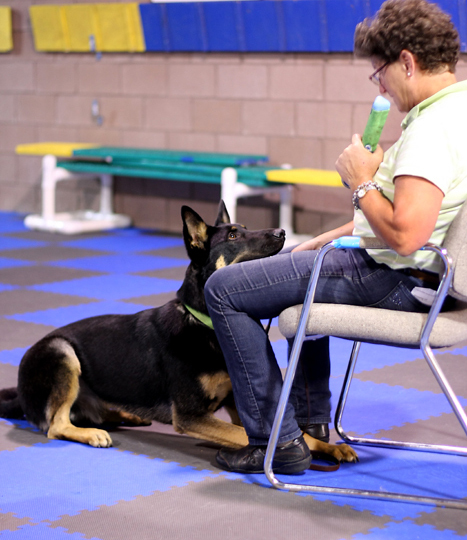 Using the basic skills you learned in our Beginner Obedience (or a similar class), you will begin to work on your dog's ability to focus for longer periods or times and in a variety of settings. Working in this class will help your dog achieve reliability. And reliable dogs can become a more integrated part of your life. All Classes are limited to 6 dogs. Neither of these classes is appropriate for a dog with special training needs. If your dog is excessively shy, fearful, reactive, aggressive, or if there are other concerns, please contact us for guidance before enrolling.